According to recent surveys upto a quarter of people do not check credentials of their electrician before hiring them. Half of all house fires are caused by electrical accidents. Estimates say there are around 20,000 non -registered electricians currently operating in the country. With it being very simple to check credentials online via scheme providers websites. (NICEIC,Napit,Elecsa etc). Here are some pictures of jobs we have been called out to and found potential fire risks. Recently found this when changing an old rewireable type consumer unit to a 17th edition dual RCD unit. 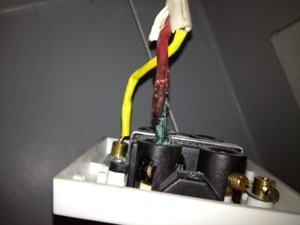 The sockets circuit had been overload with electrical heaters, which was a huge fire risk as you can see from the melting on the wire’s insulation in the picture. 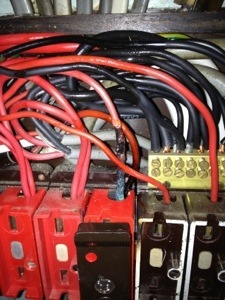 Great care must be taken not to overload circuits especially on old style consumer units.